> At least 10 years of banking experience in Banking Operations and Credit with minimum of 3 years in Credit in Officer and above Cadre. > Minimum 2 years in the Managerial cadre i.e. Deputy Manager and above & minimum 7 years in the Officer & above cadre including Managerial cadre. Age : Not exceeding 42 years as on 12th February, 2019. > Fluency in written and spoken English and Nepali. > Working knowledge of Office Applications. > Good interpersonal, communication and marketing skills along with ability to maintain effective working relations with people. Application without disclosure of age and minimum qualification mentioned above shall be disqualified. For the above mentioned positions only shortlisted candidates will be called for further selection process which will be communicated individually. The number of vacancy may vary depending upon the suitability of the candidate and changes in bank’s requirement. The Bank reserves the right to reject any or all applications without assigning any reason whatsoever. Candidates canvassing for the jobs at any stage of selection process shall be disqualified immediately. Telephonic query will not be entertained. 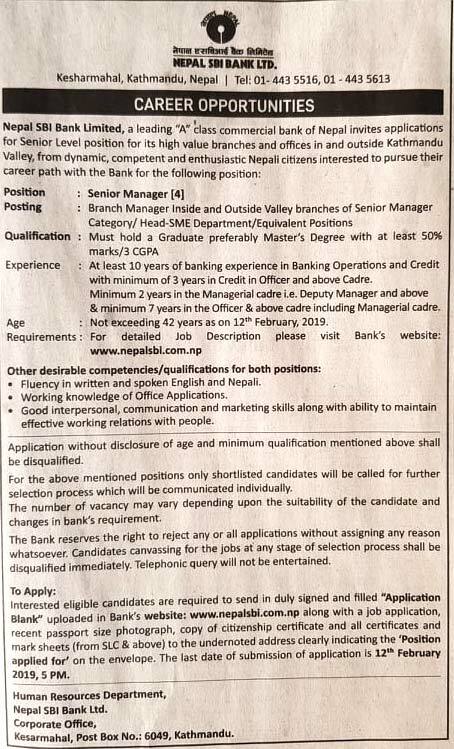 Interested eligible candidates are required to send in duly signed and filled“Application Blank” uploaded in Bank’s website: www.nepalsbi.com.np along with a job application, recent passport size photograph, copy of citizenship certificate and all certificates and mark sheets (from SLC & above) to the undernoted address clearly indicating the ‘Position applied for’ on the envelope. The last date of submission of application is 12th February 2019, 5 PM. Kesarmahal, Post Box No. : 6049, Kathmandu.